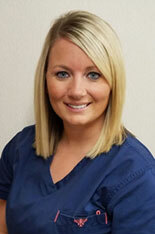 Meet our Sioux City IA dental team! We are pleased to offer a range of dentistry services! Dr. Salmons believes quality care starts with quality people, and he feels particularly fortunate to work with his outstanding team. They are not only extremely competent, but unusually warm and friendly. He’s certain you’ll notice the difference this makes from your very first visit! Anne, who has achieved not only Registered Dental Assistant and Certified Dental Assistant but also Expanded Functions Dental Assistant certifications, has been with our practice for 12 years. 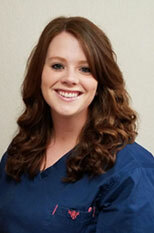 She also has advanced mini dental implant training. The mother of twin 16-year-old daughters, a 4-year-old son, and a dog named Buddy, Anne enjoys being outside and watching her twins play varsity basketball. Marisa, who has been with our practice for five years, also has her RDA and CDA certifications and advanced mini dental implant training. She and her husband, Tanner, are celebrating the recent birth of their son. They also have two black Labs, Stormy and Nova. Marisa enjoys Husker football, crafting, and bonfires. 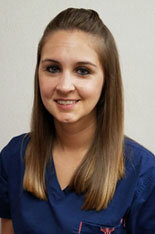 Kourtney is a Registered Dental Assistant with advanced mini dental implant training. She and her fiancé, Chad, have two boys. When she’s not working, she loves watching her boys play baseball, play football, and wrestle. She also enjoys being outside and watching Hawkeye football. 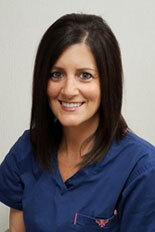 Lori, who has additional training in local anesthesia, diode laser, and nitrous oxide administration, has been working with Dr. Salmons for five years. Lori is happily married to Jed and has a daughter and two stepdaughters, as well as a dog, Addie. She loves camping in the summer with her entire family and watching her daughter Kelsey play college volleyball. She also loves the outdoors, doing yardwork, hiking, biking, and kayaking. Our talented team members bring years of combined dental experience to our ultra-modern office. Schedule a visit today at (712) 239-5900 to experience our team first hand.